The developer’s long-delayed retail impact statement for a proposed supermarket on the Mytholm Works site comes clean about a fact that Incredible Edible Mytholm has all along strongly suspected – that no supermarket is associated with the planning application. The site owner has had to reveal this, because to carry out the retail impact assessment, they have to say how much trading the proposed supermarket will carry out. But they don’t know, because there is no proposed supermarket. So, without a supermarket lined up, the developers’ consultants have had to create two scenarios, one for a “Top 5” supermarket, and the other for a “discount” supermarket. Despite the Planning Officer’s recommendation to refuse the Setbray/Belmont Homes planning application for a supermarket, hotel and hydro power station on the Mytholm Works site, Calderdale Council Planning Committee yesterday voted to defer the application, in order to give the developers time to submit a retail impact assessment. The developers had refused to provide one when the Planning Officer had asked them for a retail impact assessment during pre-Planning Committee discussions. Chaired by Calderdale Councillor Janet Battye, a packed public meeting upstairs at the Stubbing Wharf pub fired questions about the proposed supermarket and hotel development to Calderdale planning officer Richard Seaman, architect Sam Deakin and the developers’ planning consultant Roger Lee. The current plannning application by Setbray Properties and Belmont Homes, for a hotel and supermarket on the Mytholm Works site, isn’t the only game in town. IncredibleEdible Mytholm is currently applying for funding to cover the costs of commissioning a business plan, to find out about the economic viability of our ideas for a community-owned, not-for-profit sustainable food business on the site. These are the brainchild of Dr Nik Green, who last October took time out from managing the Incredible Farm market garden in Walsden to talk about his ideas for a community-owned development at Mytholm works that would provide a “farm gate” retail outlet for locally produced food, alongside a permaculture market garden, an apprenticeship scheme for market gardeners, and an ecohotel and tourist attraction that could rival Cornwall’s Eden Project. 100 jobs? Fact or fiction? 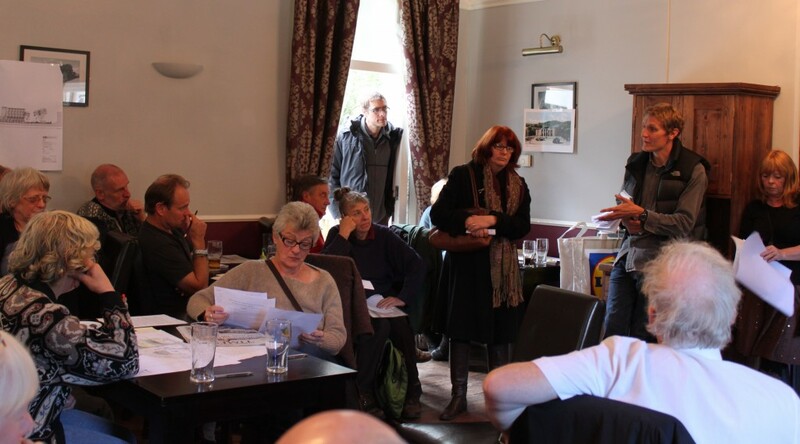 The upstairs room at Stubbing Wharf pub was full when Friends of Mytholm gathered at Sunday lunchtime to discuss the Belmont Homes and Setbray Properties proposal to build a car park, hotel and small supermarket on the Mytholm Works site, opposite the pub.